The UNC Board of Governors met in Charlotte today. The full UNC Board of Governors met in Charlotte this morning and voted unanimously to close three academic centers. The centers ordered to close are: the Center on Poverty, Work, and Opportunity at UNC Chapel Hill; the Center for Biodiversity at East Carolina; and the Institute for Civic Engagement and Social Change at NC Central. 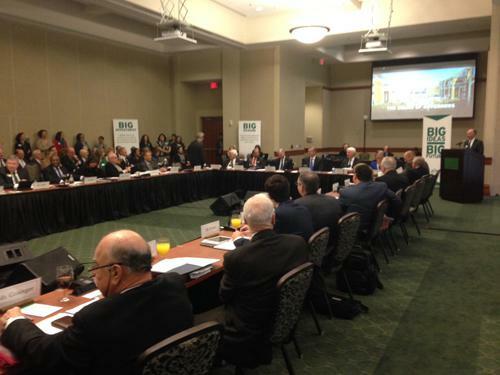 Board of Governors leadership denied that politics played a role. Dozens of students and others attended the Board meeting and protested the decision. Several spoke out during the discussion and were removed from the meeting. Board Chair John Fennebresque eventually had to recess and move the meeting to another room as protestors shouted and chanted outside the door. UNC-Chapel Hill Chancellor Carol Folt also spoke during the BOG discussion, but she did not specifically address the closing of the Poverty Center. The full Board vote followed a review by a Board committee that investigated all 247 academic centers and institutes. That probe began after the General Assembly, in its budget passed last year, called for the review in an attempt to save $15 million. The three academic centers set to close receive a total of $6,000 in direct state funding. The Poverty Center at UNC-Chapel Hill receives no direct funding from the state. Its $120,000 budget is funded by private sources. Supporters of the UNC Poverty Center say it was targeted because of the political advocacy of its director, Gene Nichol. “The university’s governing board moved to abolish an academic center in order to punish its director for publishing articles that displease the board and its political benefactors,” Nichol said in a statement. "Were I to have praised the legislature's war on poor people rather than decry it, the board would have placed laurels on my head instead of boots on my neck." Nichol will continue as a tenured faculty member in the UNC Law School. Thirteen other centers must be reviewed by the Board of Trustees on their respective campuses. The Board also passed a clarified policy on political advocacy of center personnel. Some members expressed a concern that the Board of Governors got involved in campus-level academic decisions. The Board of Governors voted to enact reviews of campus centers every five years. Also during the meeting, the Board voted to increase tuition at several campuses in the UNC system, including UNC-Chapel Hill, NC State, and NC Central. The average tuition increase will be 4.3% next year and 3.7% the year after that. The Board voted 18-9 to raise tuition, after some debate.